Prophet- Malachi is the last of the prophets. He is thought to have lived around 500 – 480 BCE after the construction of the Second Temple. The haftarah begins by recognizing the transgressions of the Jews. God, through Malachi, lists the sins committed by the Jews- theft, lying, cheating, adultery and more. The Jews ask about certain accusations and God answers them. Throughout there is a path of forgiveness with the simile that as a man spares his son the Jews will be spared. Verse 23 is read twice. It is the second last verse of this reading. “Behold I will send you Elijah the prophet before the coming of the great and terrible day of the Lord.” That verse is read again at the very end of the portion. That phrase was the catalyst for the image I painted for this haftarah. After the dinner we read the phrase “Pour out Thy wrath upon the nations that do not know you…” We open our door to allow Eliyahu (Elijah) into our home to drink some wine. In some haggadot there is a picture of Eliyahu riding a donkey and blowing a shofar- announcing the Messiah. There are some lovely woodcuts and paintings in haggadot from the 15th – 17th centuries. 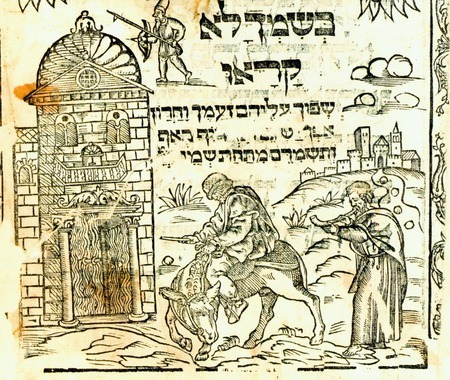 This woodcut is from a haggadah published in Prague, 1526. I chose the image below for my illustration of Shabbat HaGadol. It is from Mantua, 1560. Other notable haggadah illustrations of Eliahou are from Germany, c. 1425 ; the Washington Haggadah from Italy, 1478; and one from Venice 1609. The end of the haftarah is lovely. Malachi says, “…he shall turn the heart of the fathers to the childen, and the heart of the children to their fathers:” It’s a beautiful idea. It makes me think of the 4 children in the haggadah. Whatever else is happening in their relationships, at the Pesach seder they come back home to sit and discuss and debate with their family- those they love. What a beautiful connection you made, Laya — linking the passage we read from Malachi with the four sons (or children) through the line “he shall turn the heart of the fathers to the children, and the heart of the children to their fathers.” I am always moved by those words when we read them at the seder. This year, I’ll think of the Four Sons/Children when we open the door for Elijah. Thank you so much, Margie. I’m glad this opened up a new connection for you. I’ll be thinking of that too. I was totally unaware of Malachi. Thank you for writing about this haftarah and educating me . What a beautiful quotation to think about, especially as an antidote to the four sons. Very impressed with the historical illustrations you reference. I would love it if you gave a talk on ALL the historical illustrations you found and used in your magnum opus haftarah book. Reading the haftaroth with greater focus always brings surprising insights. That quote about fathers and children resonates deeply with concepts of the seder. And of course Malachi and his inclusion of Elijah is so interesting. Thanks so much, Zahava. Birkat Chaverim said: Nice. I think that its Eliyahu with the shofar and the man on the donkey iconography is the Mashiach. I think Shalom Sabar may have an article on the topic in that big Jewish Art volume on Jerusalem. Although i may be misremembering. Laya Crust Artist Thank-you for the comment. I think you are right. I’m not familiar with that publication- can you share some more information? I’d love to read the article.